Airguns are a low cost form of shooting, and great fun for all, thanks to the instant feedback from hitting a target. However, they do come in all shapes and sizes, and can be something of a minefield for the new shooter, so we’ve put together this blog post to guide you through the pitfalls! We here at Pellpax strive to be one of the best air rifle shops in the UK, and provide all the essential equipment that you require to start shooting. Furthermore, with our UK airgun delivery service we can deliver airguns and accessories to your door! The first thing that you’ll need is an airgun. This is the catch-all term for air rifles, or air pistols, and these come in different power types and calibres. For newbies, I’d recommend an air rifle, as they are more accurate than pistols, and easier to shoot accurately, as they have a longer barrel, and benefit from a stock to hold them steady. Once you’ve mastered the basics of shooting then you can add a pistol to the collection, but when starting out it’s very easy to be disheartened with a pistol. For a Newbie, a spring rifle is definitely the way to go. Spring rifles require minimal maintenance and no power source such as Co2 capsules, or an air bottle. The only power source is yourself, breaking and cocking the barrel on each shot. Spring rifles have recoil when fired, but this teaches you how to shoot and hold the rifle correctly to deal with this recoil, ultimately making you a better shot! When it comes to firing the rifle, you can either shoot with a scope, or open sights. 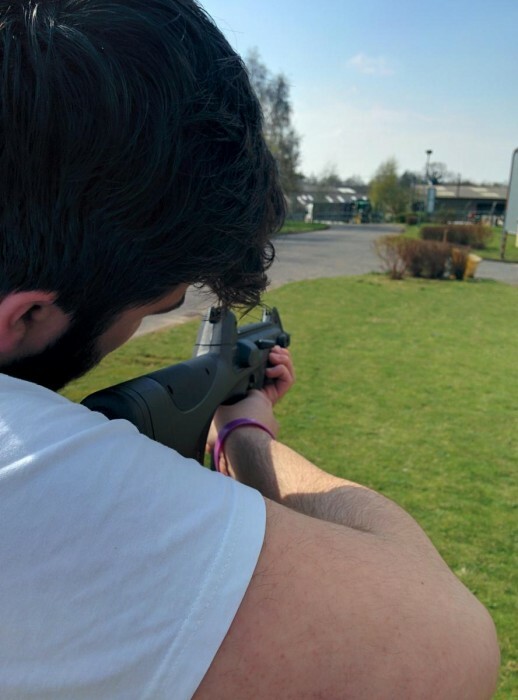 Open sights are more of a challenge than a scope is, but if you’re ultimately looking at a sporting event such as 10 metre or bell target shooting, then only open sights are permitted. For anything else such as hunting, Field Target or Hunter Field Target shooting, a scope is a much better choice. For a starter scope, then either the Hawke Vantage 4×32 Mil dot Scope or the Hawke Vantage 3-9×40 Mil dot Scope are great choices. All of Hawkes scopes range comes with a lifetime warranty and of superb quality, making them a great starting point for newbies. As well as a rifle and scope, then other accessories are pellets and possibly a bag to keep everything safe in. Luckily we have put together several cheap air rifle kits which include a rifle, scope, bag, and pellets to get you started and shooting, as soon it is delivered by our fleet of vans. Rifle kits start from around the £100 mark and increase upwards from there. For £108.99 the Stinger UL Starter Kit .177 includes the rifle which fires at around 7 ft/lbs, which is more than enough for target shooting, and includes the rifle, 4×32 scope with mounts, gun bag and a tin of pellets. A great choice for those looking for something which won’t break the bank. If you’re looking for something a bit higher quality, and harder wearing, then we can offer the Smallholders Kit, which comes with a full power .22 rifle, a hard and durable synthetic black stock, a 4×32 Scope with Mounts, a tin of pellets, and a gun bag. Again this is everything you need to get started, and also it benefits from a little bit more muzzle energy, meaning it can be used for pest control and hunting up to ranges of around 40 metres. Other areas to consider are second hand stores such as online websites, and your local gun shop which might have a selection of second hand goods. You can quite often pick up an older rifle such as a Weihrauch or BSA which has had a fair bit of use, but these are still plenty good enough for target shooting. Of course, you can have it refurbished and returned back to its former glory with a service. Most gunsmiths should be able to offer this but it depends on how much work is involved, and their standard charges. Before purchasing anything, though, I would recommend making sure that you know what the law is regarding air rifles and air pistols, so check out our Airguns Laws to ensure that you’re brushed up on the latest rules. Check out our range of air rifle kits here. Check out the full Hawke scopes range here. Learn about air rifle laws here. And grab your shooting targets here.